1)A doubt about your MCC size? 2) A doubt about the MCC ankle measurements? 3) Can we use the same heels on boots, pumps and sandals? The My Choupi Chouz fit normally. It is therefore recommended to choose your usual size. The sizes available on the website are the French sizes. 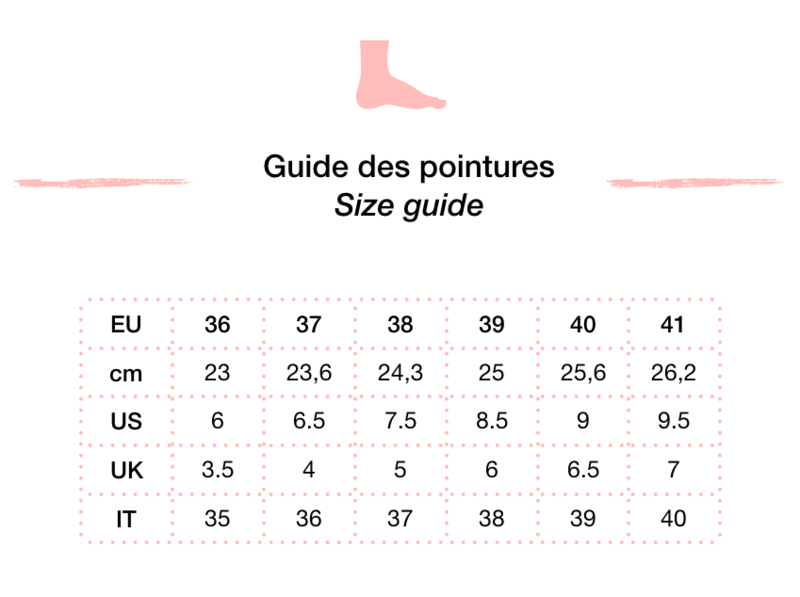 Please find below a table to enable you to compare the French sizes with the US, UK and Italian sizes as well as the feet sizes in cm. We recommend you to mainly refer to your European size, if you know it. You are still not sure about your size? Thanks to the foot ruler available on this pdf to print at 100% scale, you could have a better idea of your Choup’size! Assuming you are usually between two sizes, choose the larger size and add a small sole, if necessary, e.g. if you usually wear a 38.5, order a size 39. Assuming you are usually between two sizes, choose the smaller size if you have a slim feet (and not so long), e.g. if you usually wear a 38.5, order a size 38 (French sizes). Choose the larger size if you have a large feet, e.g. if you usually wear a 38.5, order a size 39 (French sizes). * the measurements can vary from few millimeters according to the shoe style. Please note that the ankle circumference of the zip boots are a bit more tight than the elastic boots because of the shoe construction. Our measurement chart will come back updated soon. Yes, heels are completely interchangeable between the MCC models of shoes. The goal of My Choupi Chouz is to allow you to really have fun with different combinations of heels! Thus, you can wear the 4.5 cm Rue heels, the 8 cm Avenue heels and the 9 cm Place heels on your boots, your pumps, your babies as well as on your MCC sandals. Awesome, right? A question about the delivery, return or exchange? Check here! For any question: please send a nice letter at hello@mychoupichouz.fr.